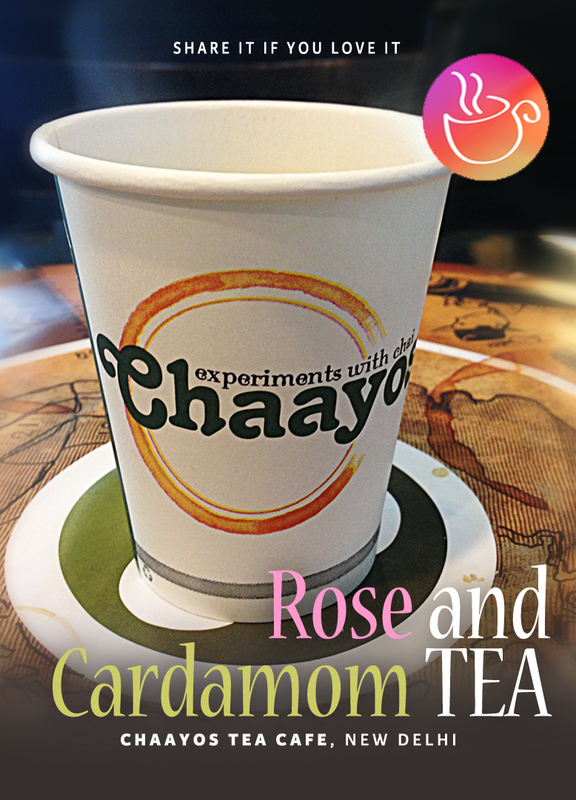 My special Rose and Cardamom TEA, available at all Chaayos outlets. This is one of my favorite tea recipes and is very special to me. You’ll enjoy making it as much as you’ll savor sipping it. It’s completely tealicious. You can make it yourself and if you are in Delhi, you can also go to one of the Chaayos tea café outlets and enjoy my aromatic cuppa there. Depending on the servings, add crushed cardamom to boiling water (1 cardamom pod per cup). Then add organic tea to pre-boiled water and let it brew. Strain and serve it in your cup. Now, add edible rose water to your tea (2 tsp/cup) and stir it up. Add sugar as per taste. If you don’t find edible rose water in the market, no problem. You can make it right in your kitchen. I’ll blog about it soon. On a day, when you want to escape to planet RELAX. This is a harmony tea tonic. This entry was posted in Tea Recipes and tagged assam tea, chaayos, chaayos new delhi, chaayos rose cardamom tea, chaayos tea, DIY, edible rose water, Green Tea, make rose water, rose cardamom tea, rose tea, special tea at chaayos, tea blog, tea cafe new delhi, tea movement, tea recipe, tea sommelier. Bookmark the permalink. ← What Do Footballers Drink? @LoveforTeaDelhi This looks like a great recipe indeed! What other tea blends do you like to enjoy? What a great recipe! Thank you for sharing and I’ll be looking forward to more of these jewels! @LoveforTeaDelhi we will have to try this tea recipe. thanks for sharing!